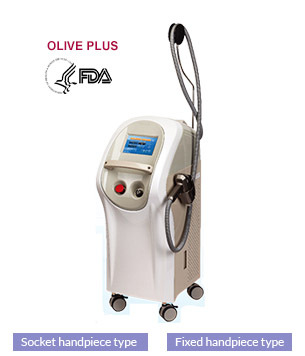 Olive, the 810nm pulse diode laser, destroys the black melanin pigments in the hair follicle to remove hair easily. The beam of Olive provides identical amounts of energy for all pulses to reduce pain and protect surrounding skin tissues. 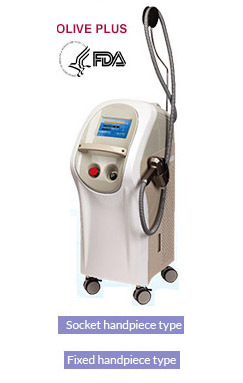 Other ordinary lasers have a lot of pain even though people use EMLA cream because the lasers haven’t have the precise energy for each skin type. So it has some of common side effects as burn, pain, pigmentation and inflammation. Unlike other devices, Olive laser can deliver the most precise energy to the dermal layer safely until the hair follicle is destroyed without EMLA cream because it has a power cooling system. 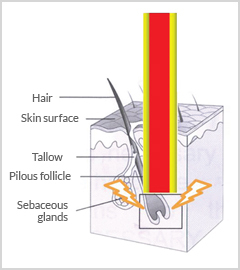 Olive laser leads to heat diffusion from the bulb to the area of the bulge and the matrix cells, leading to destruction of the capacity for new hair follicle formation. It restrains the hair re-growth. The sapphire handpiece tip gives a permanent life time durability. It also protects the inside optical bar from the shock.